Manufacture Royale marks a new era with the introduction of the ADN. Combining their iconic design with a new more contemporary aesthetic, the Manufacture Royale ADN collection emerges in stunning evolution. At the center of it all is Manufacture Royale’s ninth calibre—the MR09—designed, built, and assembled in their workshops located in Vallorbe, Switzerland. Featuring a flying tourbillon, the resolutely modern skeleton movement displays two independent time zones, each set right to the minute. Impressive as it is ingenious, the local time is indicated by a jumping-aperture disc that reveals the time as it jumps from one hour to the next. This occurs atop 12-hour dial while a sweeping sword-shaped hand tracks the minutes on the same plane. The home time, or second time zone, remains legible and accurate with its own gear train indicating hours and minutes in a traditional display. The ultimate traveling companion, this aesthetic and technical masterpiece is produced in 28-piece limited editions, comprising traditional or high-tech materials. ADN—DNA in French—aptly describes the inspiration for the collection. 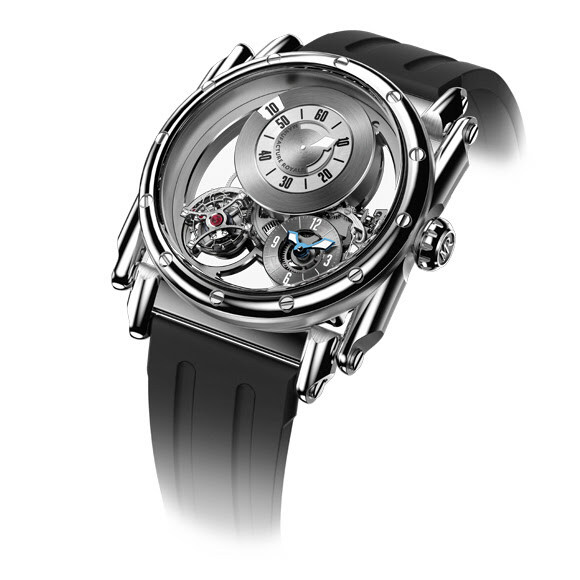 The Manufacture Royale ADN’s case is derived from the Opera and Androgyne models. Its curves have been rounded and softened, bestowing its ‘steampunk’ style with an even more modern character. Its mobile lugs pivot on the case formed by two lateral stretcher pieces enclosing the middle, whose round bezel is held by 12 screws. This technical construction (no fewer than 67 components) and studied for optimal ergonomics provides excellent comfort on the wrist, despite its 46-mm diameter. What’s more, the multi-piece construction allows for an infinite number of material combinations. In fact, the Manufacture Royale ADN watch is currently available in three variations: stainless steel, stainless steel DLC and forged carbon, and rose gold and forged carbon. The ADN model is built around the exclusive MR09 calibre, a new demonstration of the creativity and combined expertise of the Manufacture. Designed with travel or dual timing in mind, this manually wound mechanical movement indicates a local, or primary time zone on a dial at the 12 o’clock position combining an innovative “jumping hour” digital display. It also boasts an analogue minute display featuring a single sword-shaped hand. The periodical jump of a disc reveals the hour through an aperture at the exact place where the number is traditionally positioned on the dial. It is quick, intuitive and fun to read. The home time, or secondary time zone indication, is offset at 4 o’clock on a sub-dial with an open-worked center. The minutes are independent from the primary time zone due to a second gear train attached to the movement’s power source. This rare and useful functionality is suited to all time zones, including those which vary by 30 or 15 minutes from the GMT reference. For added sophistication, the hours and minutes of the second time zone are set using the crown without the use of traditional push-pieces or adjustment buttons. The watch is set in position 1 for the primary time zone and position 2 for the secondary time zone. 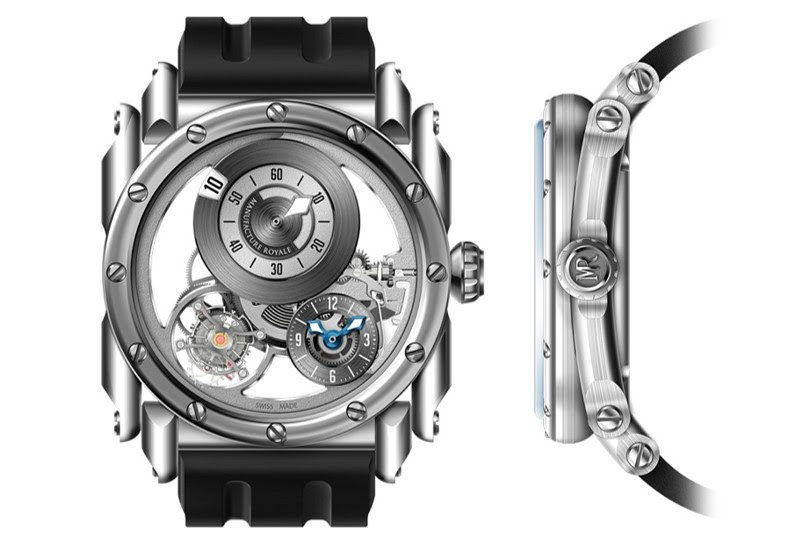 The calibre MR09 is regulated by a one-minute flying tourbillon which fights against the effects of gravity. Mounted on ceramic ball bearings and comprised of a silicon escapement wheel and pallet, the tourbillon cage is fixed only on one side. This feature allows for admiration of its fascinating ballet and splendid hand-finishings. Its balance with regulating screws oscillates at 21,600 vibrations per hour for a power reserve of an impressive 80-hour minimum. The Manufacture Royale ADN enhances the structure of the movement in a highly technical production by playing on transparency and volumes; this excellence is achieved through the removal of unnecessary components. Through Manufacture Royale’s customized approach, superb movement finishings are applied to the design of each variation. The finely angled bridges feature a rhodium finish for the stainless-steel model and a darker NAC finish for the forged carbon models. The watch’s caseback features a sapphire crystal fastened by four screws which reveals the movement. The stainless steel-DLC version’s crystal is tinted red, reflecting the touches of color that punctuate other elements of its design and reveals its splendid architecture under a different light. Magnified by the ‘skeleton’ execution, the functions are connected in a circle around the barrel with the tourbillon, the jumping hour mechanism of the first time zone (with its regulating spring and jumper) and the mechanism of the second time zone. From its hand-chamfering, circular-graining, brushed polishing, and hooping, everything is perfectly finished to reveal exquisite detail. The Manufacture Royale ADN watch is offered on a flexible rubber or an alligator strap with a stainless steel or stainless steel-DLC folding buckle, ensuring both comfort and security. Forged carbon: strong, lightweight and pleasant to the touch, this technological material is made by molding carbon fibers to create a uniform structure that can withstand extreme temperatures and high-pressure conditions. Its production also allows complex forms to be obtained. DLC: the acronym DLC (Diamond-like Carbon), also called amorphous carbon, is a carbon-based material that is vacuum-melted and deposited in thin layers onto a substrate; it is characterized by its high resistance to wear and corrosion, stability, and excellent friction coefficient.